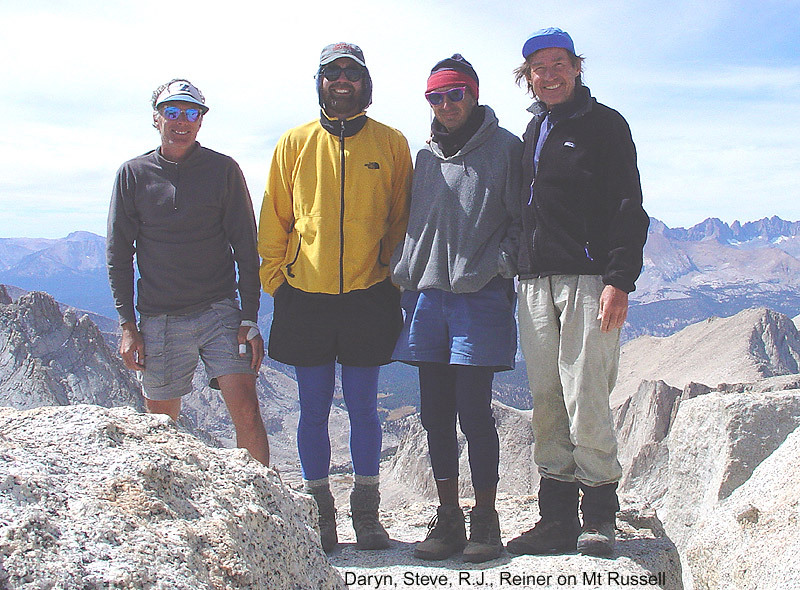 This peak-climbing trip was jointly sponsored by the Sierra Peaks Section and the Ski Mountaineers Section, which also does summer peak climbs. Due to the difficulty of getting wilderness permits for the Whitney zone, the trip had to be rescheduled to a mid-week date, causing a small turnout. We were a group of four, Daryn Dodge, Steve Eckert, R.J. Secor and myself. With three list finishers in the group one objective was to explore unlisted peaks and some new routes on SPS peaks. 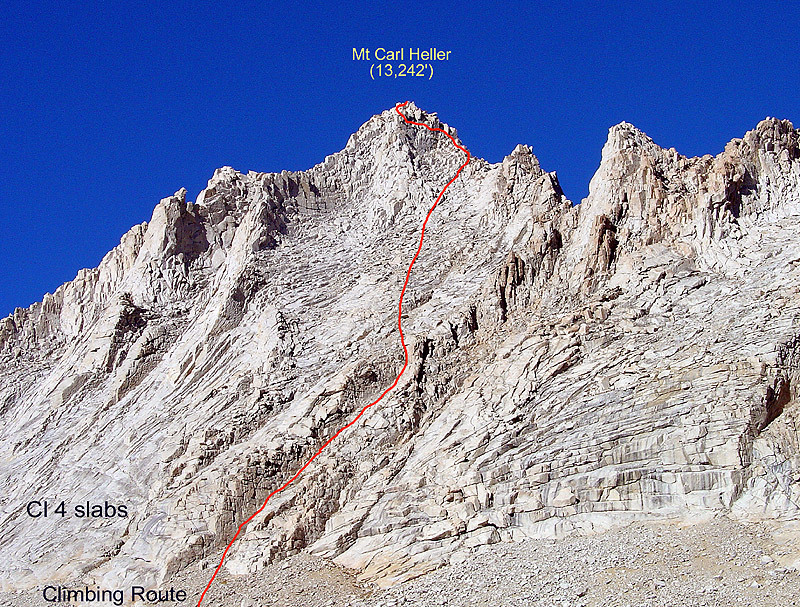 In particular, Mt Carl Heller was our goal since it is a challenging climb and there were no previous trip descriptions in the SPS Archives or on climber.org. 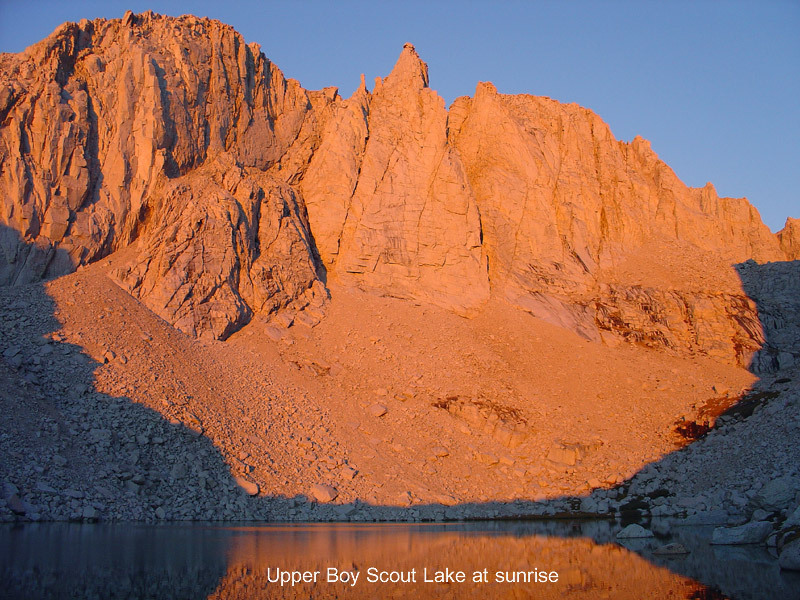 All six peaks we climbed are in the vicinity of Tulainyo Lake, 1.5mi NE of Mt Whitney. 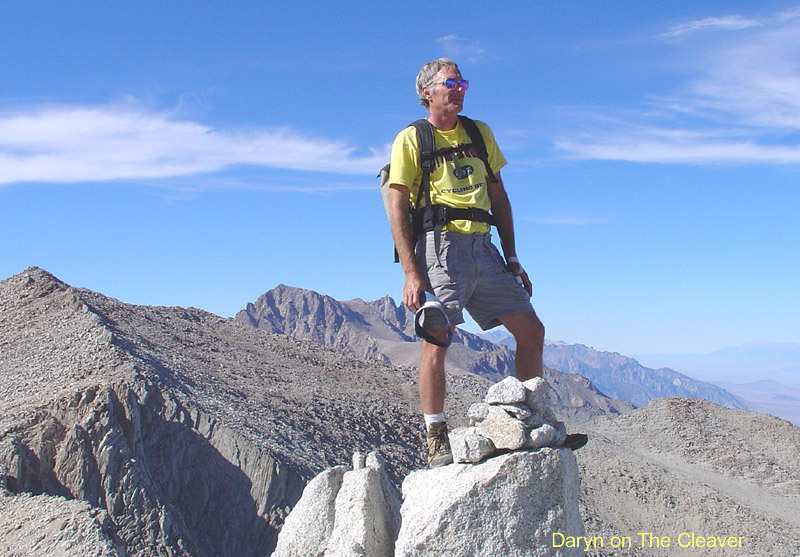 We met on Tue, 9/21, 8am at Whitney Portal and hiked up the North Fork of Lone Pine Creek (trail starts on the north side of the creek) to the Upper Boy Scout Lake (about 3mi, 3000' gain). There we set up camp for the next three nights. 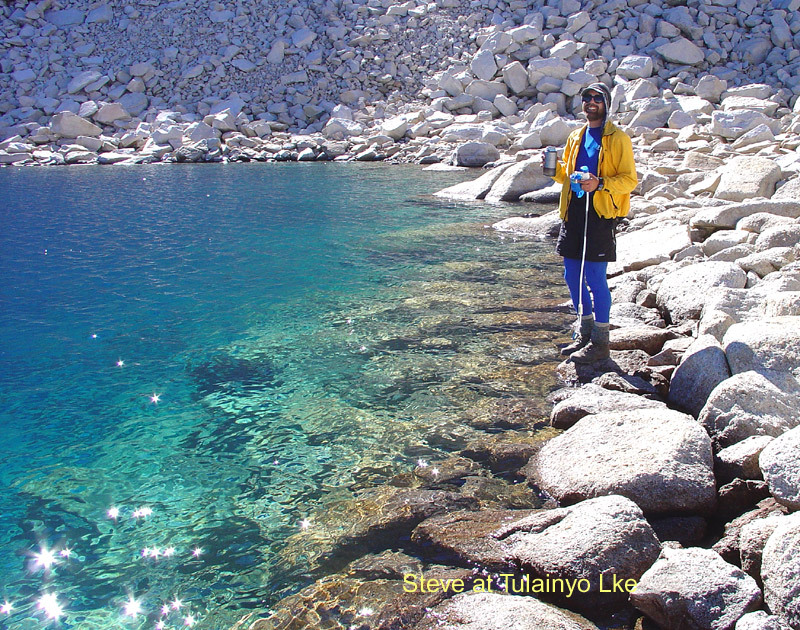 Camping at the next higher lake, Tulainyo Lke (12,800'), is not ideal. On Wed, 9/22, we left camp at 7:15am and hiked up the standard route (SE slopes) to the Russell-Carillon Pass (13,280'). It is a 1300' climb on sandy slopes with dispersed loose rocks. However, the north side of the pass to Lake Tulainyo is steep. We headed first to Tunnabora Pk (13,565') since R.J.'s objective was to take pictures of the East Ridge of Carl Heller in the morning sun. The peak register was stolen and we replaced it with a new SPS booklet. From Tunnabora one has a great view of the steep and rugged walls of the peaks between Vacation Pass and Tunnabora. 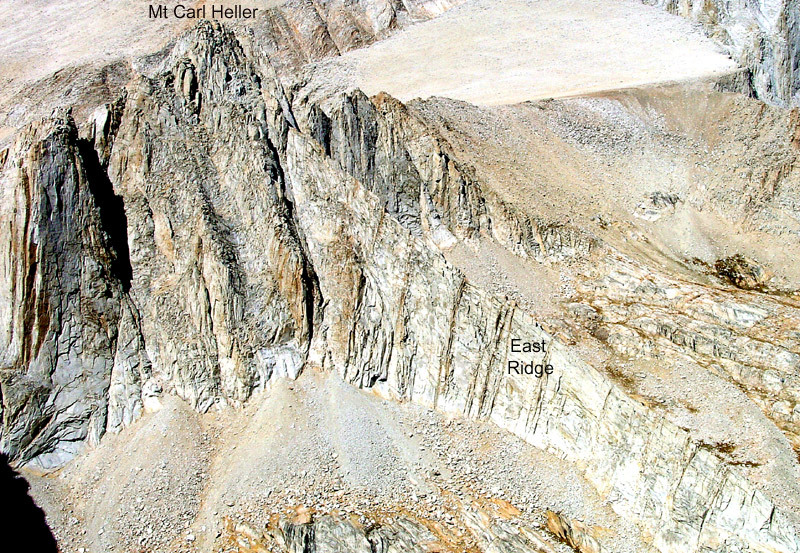 The highest peak just south of Vacation Pass is Mt Carl Heller (Peak 4031m; UTM 11 383943E, 4052342N, 13,242', NAD 27). 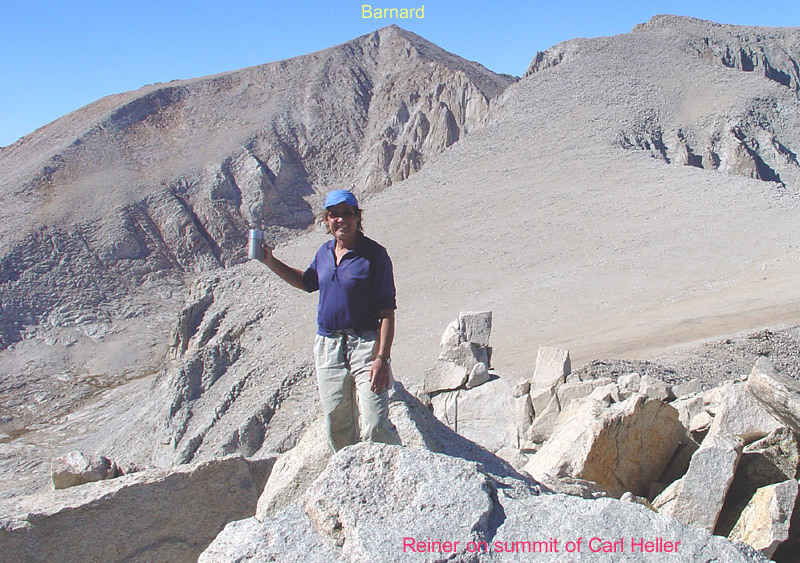 R.J. needed more time for his pictures and decided to forgo the climb of Carl Heller, which he had done before. Three of us descended Tunnabora, headed west to a steep 200m drop off toward Wallace Lake but contoured NW above the lake at about 3700m. There is a multitude of peaks along the ridge and from nearby it is not easy to decide which one is the highest. However, it is no problem with a GPS. We first attempted an ascent over smooth granite slabs straight up to the summit but soon realized that this got us into class 4 terrain. 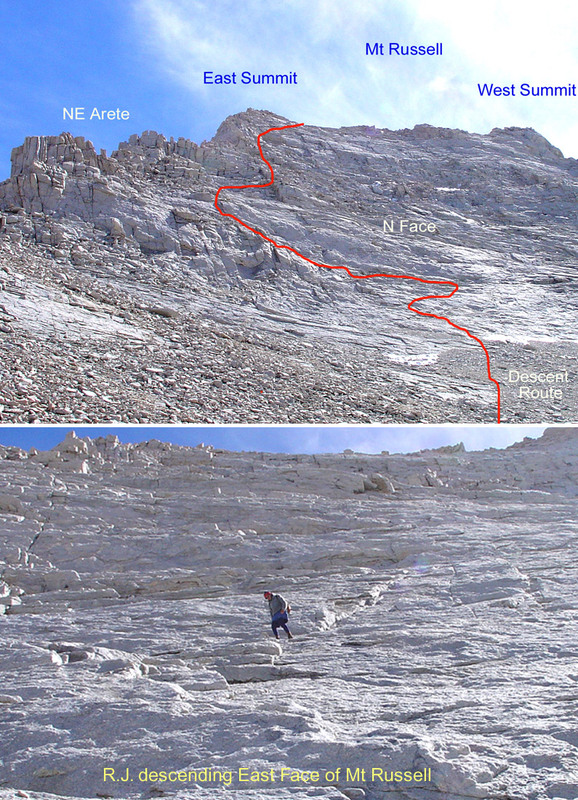 Then we followed R.J.'s advice to ascend a broad chute southwest of the summit. But from the base one cannot see a broad chute, only narrow gullies at the southern end of the granite slabs. We ascended one, starting at UTM 11 383796E, 4052080N, 12,391'. Half-way up to the ridge we turned left since the gully led to a wrong peak. We climbed over a small ridge, which led into the mentioned broad chute SW of the summit. Now the correct peak became visible. Its south face consists of nearly vertical granite columns. After ascending the broad cl2 chute to the ridge we climbed north on the cl 3 ridge until we ran into the vertical walls. Luckily, there were narrow ledges along the broken vertical slabs. We contoured parallel to the wall until we found a tilted slab, which could be ascended with a layback. After this short cl4 move we were on the true ridge and very soon on the summit. There we found an SPS cylinder and were eager to read the book, but to our disappointment it was also stolen. Since we had no more register books, we left a signed sheet of paper in the cylinder. By radio we contacted R.J. on the neighboring peak. We enjoyed the views, the fine weather, a snack, then descended the same route that we came up. Daryn got a few scratches when a big boulder tumbled down. Then it was a long XC hike out from near Wallace Lake to Russell-Carillon Pass. Steve was feeling the altitude. By 6:30pm the last made it over the pass and by 7:30pm we were in camp by last daylight. On Thur, 9/23, we left camp earlier for a 3-peak climbing day. The first adventure was to explore the "Rockwell variation" to the Russell-Carillon Pass. This route goes NW along the inlet stream of the Upper Boy Scout Lake into a cirque SE of Mt Russell. From there one climbs a steep, sandy, 1000' chute with loose rock to a col just at the start of the east ridge of Mt Russell above the R-C Pass. After regrouping we climbed Mt Russell via the cl 3 East Ridge. 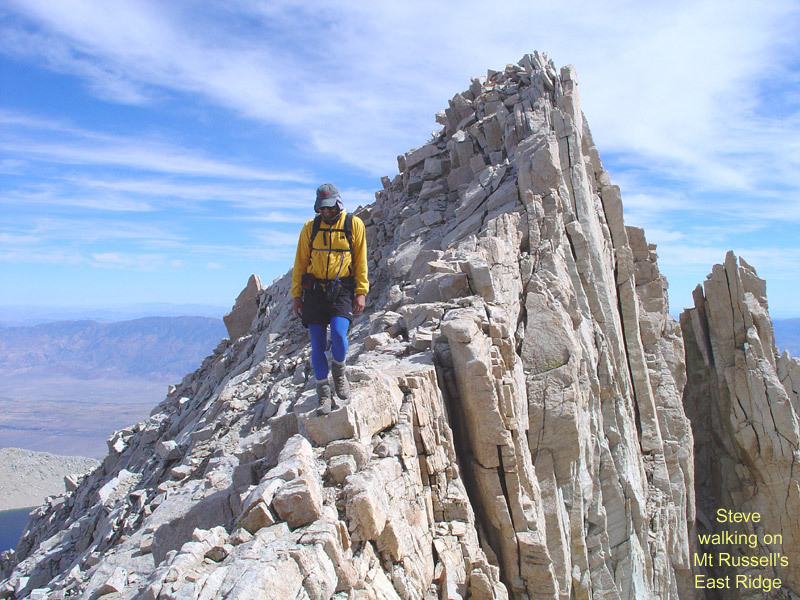 It is a long ridge with some exposure, a false east summit and finally the true west summit. We were glad to find a peak register. 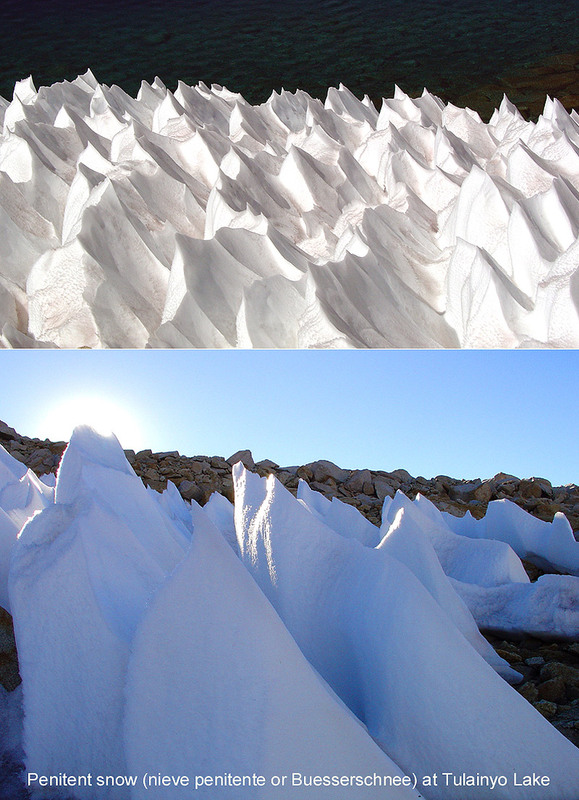 This peak is climbed frequently and a booklet is filled every few years. On our return we followed a different route, the cl 3 North Arete, which R.J. had once done. The "R.J. variation" starts at the east summit and initially follows the north ridge until this turns into cl4 terrain. Then one has to go on the north face, which consists of steep slabs with sandy ledges. By carefully connecting the ledges we descended down to snowfields, a moraine and finally Tulainyo Lake. This lake is the highest in the Sierra Nevada, has green-blue cold water, no fish, and interesting formations of penitent snow (tilted, conical, giant suncups, 3 to 5 feet deep, some down to the bare ground). 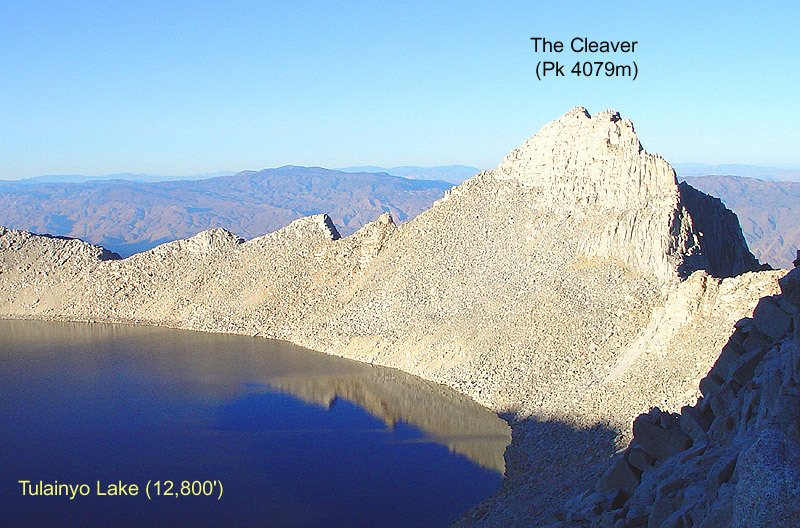 Our next destination was "The Cleaver" or Peak 4079m, 0.1mi east of Tulainyo Lake (UTM 11 386055E, 4050783N). Remembering the previous 12hr day, Steve decided to forgo this peak and meet us on Carillon later. We contoured around the north side of the lake, and then ascended the peak from the west first on talus, then on ledges below the cl 3 northwest ridge. It was an enjoyable short climb. There was no register on this summit. But R.J. came prepared with a new booklet and two stacked soup cans, which may last till someone "collects" this register, too. We talked by radio to Steve who was relaxing on the summit of Carillon, our next destination. After descending from The Cleaver we contoured around the south shore of Tulainyo Lake, ascended Russell-Carillon Pass and the easy west slope/ridge to the summit of Mt Carillon (13,552'). We enjoyed the evening sun, read through two volumes of register books, and then headed down the sandy southeast slopes to the Upper Boy Scout Lake. This was only an 11hr day. Fri, 9/24, was the day to hike out, but not necessarily to go home. 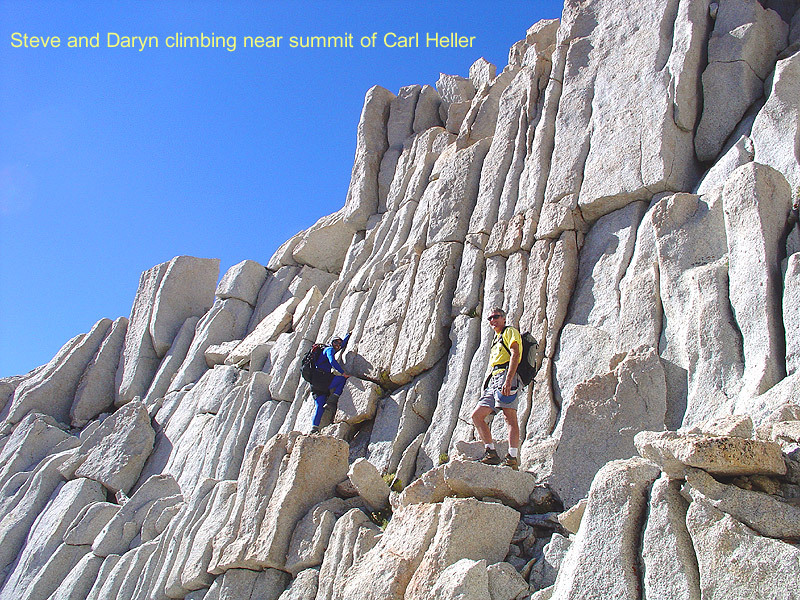 We all had different plans: Daryn and Steve signed out to climb Thor Peak in the morning. Daryn later reported that they approached the small pinnacle (supposedly near Pinnacle Pass) on Pinnacle Ridge, and after a few dead ends, managed to find a class 3 route up to the top of the ridge to the east of the small pinnacle. They found through Steve's GPS and coordinates published in R.J.'s book for Pinnacle Pass, that the pass was actually a tenth of a mile to the east on the ridge. Easy class 3 ridge-walking led to the area of the pass and on to the bowl under Thor Peak. Due to a lack of footprints in the area, it appears that pinnacle pass is seldom used by climbers. R.J. headed to Tuttle Creek to take more pictures for his new edition. I went to Bishop Pass to finish my last three peaks in the Inconsolable Range, to be described separately. This was a great week of peak climbing. Thanks to R.J. for assisting with the lead and to everyone for a good time together. > The peak register was stolen and we replaced it with a new SPS booklet. > our disappointment it was also stolen. It would seem there is quite the effort to remove registers recently. This year we were unable to locate registers on Williamson, Barnard, Trojan, and Clarence King, among others. All four of the above had the classic Sierra Club aluminum boxes but a few years ago. A large close-up photo in a Patagonia catalog last fall, showed someone holding up an old rusted film can with a scrolled paper signed by Jules Eichorn and others. Between the blurry background and those particular names, the unnamed Sierra peak was alsmost certainly Red Spur, near Big Kaweah. That such a photo would appear in a big mass-mailed glossy catalog worried me. Hopefuly there is a register-removal effort, being done by the good guys (preserving history by removing them to say the Bancroft Library where they belong) rather than by others for selfish pecuniary reasons.